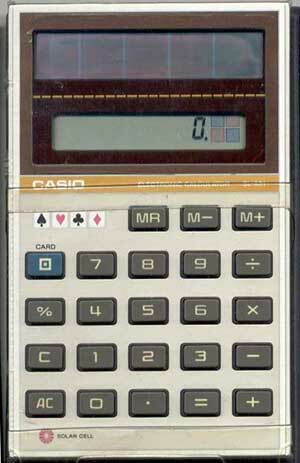 This SL-831 solar calculator by Casio provided the typical calc functions and some sort of card game, we think. Perhaps it was to be used alongside a deck of cards, we’re not sure. Hit the “card” button, and the display flashes for a couple of seconds, then a number pops up, and a suit displays in the little grid to the right. This entry was posted in Calculator by pocketcalculatorshow. Bookmark the permalink.